Please support the StampDock effort. This is a demonstration project of the Stampdock software. 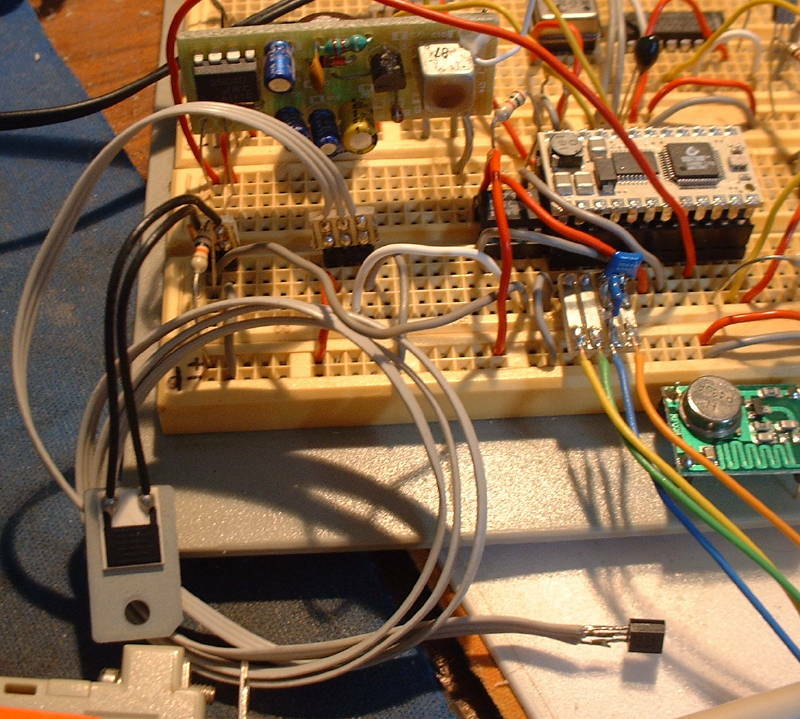 This project is a simple "javelin stamp" based wireless weather station. for outdoor temperature, air humidity, rain and wind speed and direction. project for some circuitry for that. You can download the complete project from this page. The archive contains a "Javelin stamp" program that acts as the weather station. The weather station windows/mac/linux software which acts as the display/gui/storage of the "javelin stamp". This is the first version of the GUI of the system in action. It shows a graph of last outdoor temperature and humidity values. Beneath that it shows last measured temperature, humididity, rain and wind values. The graph underneath that shows the last received puls train from the wireless outdoor station. if there was a checksum error or if the packet wasn't recognized. 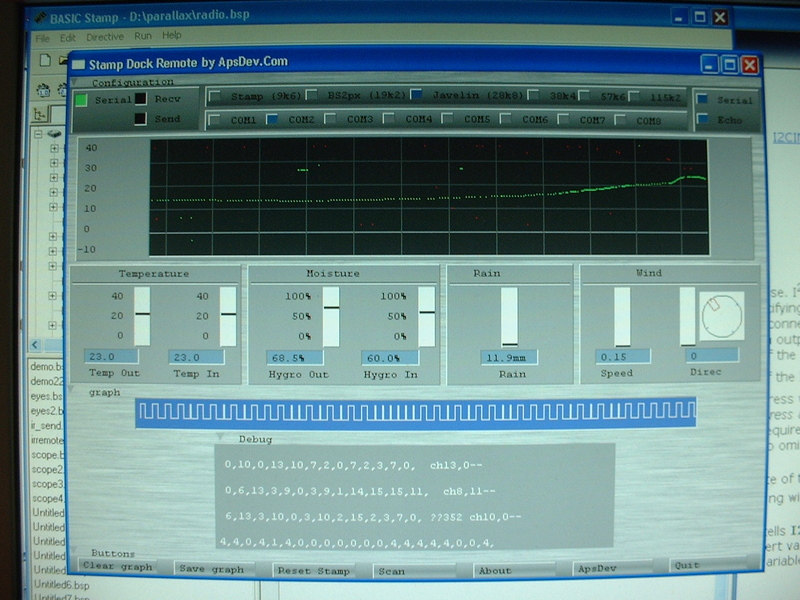 This is a picture of the hardware used to test. It contains of the "Javelin stamp" connected to a 433 Mhz AM receiver. An LTC1298 ADC chip, a TMP35 sensor and a dew sensor from an old VCR. 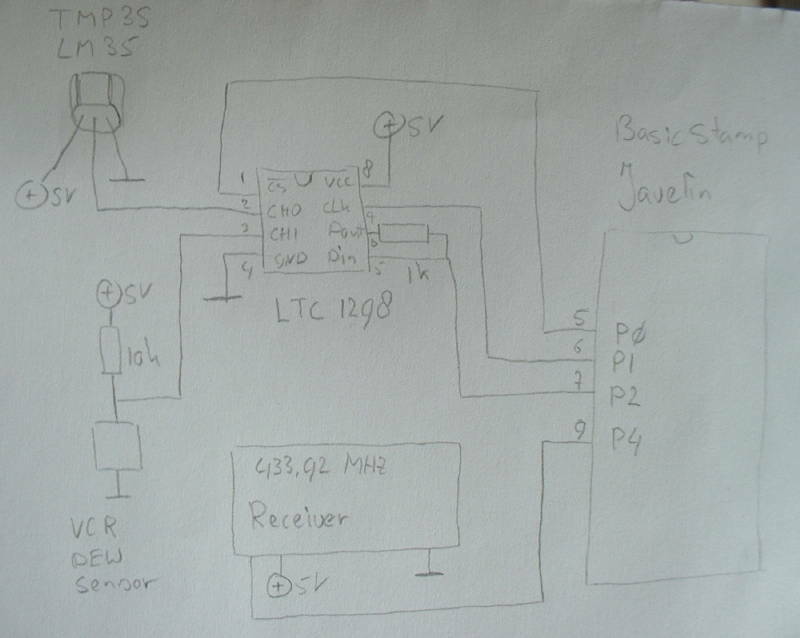 Circuit diagram in more detail. Mirror1 1-sept-10 Download V1.0 6MB Stampdock weather station.